An evil dragon has kidnapped our king! Hurry up, brave hero, and rescue him. 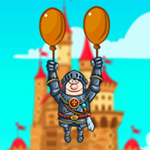 Be careful, the dragon lives on the top of the mountain and the only way to get there is with the help of balloon… Time runs out, be quick, Save the King!